The history of the Hildesheim Diocese can be traced back to the year 815. This is because the founding of the Hildesheim diocese begins with the erection of a chapel dedicated to the Holy Mother of God, this chapel being a direct predecessor of the Hildesheim Cathedral. The founding legend of the Hildesheim diocese can be traced back to Kaiser Ludwig den Frommen: according to tradition, he is said to have held a Mass in the year 815 during a hunting party at the site of the present cathedral. During their subsequent departure, however, a Chaplain forgot a St. Mary's reliquary that had been hung from a tree while celebrating the Mass. When the Kaiser returned to the location, the reliquary could no longer be removed. The Kaiser interpreted this as a sign from the Holy Mother of God and had a chapel built in this spot, dedicated to St. Mary. Under Gunthar, the first Bishop of Hildesheim (term 815-834), the Kaiser built an Episcopal Church south of the Kaiser's chapel in the year 820. The first cathedral appears just 30 years later: Bishop Altfrid (851-874) allowed it to be built over the Kaiser's chapter and to be extended westward. Bishop Othwin (945- 981) once more brought the relic of St. Epiphanius to Hildesheim and had a chapel build south of the Altfrid Cathedral which is dedicated to St. Epiphanius. 993 saw the dawn of of Bishop Bernward's term, which lasted until 1022. Bernward was among one of the great personalities of the diocese. Around the year 1000, Bernward extended and walled in the seat of the bishopric on the cathedral hill. The founding of a Benedictine convent in the episcopal city and the construction of the magnificent St. Michaelis House of God are among Bernward's special achievements. Bishop Bernward richly furnished the cathedral with works of art and had the interior walls painted. For the bronze door, the famous Bernward door in double leaf and richly embellished, cast on his behalf, he had a new western entrance hall constructed and the western crypt rebuilt. Bernward's successor, Godehard (1022-1038), immediately built a new collegiate church south of the Altfrid Cathedral on the former Ephiphanius chapel of Bishop Othwin. He then had the entire western end of the Cathedral taken down and instead built a new western front with an atrium bordered with columns and a new bell tower for a precious bell. He integrated the Bernward door into this new western front. In 1046, a blaze broke out in Hildesheim. From the Altfrid Cathedral, only the eastern choir walls, the transept and the new western Godehard front remained standing. Bishop Azelin (1044-1054) began a new building west of the surviving western front, which quasi-reflected the predecessor but surpassed it in length. The main choir with choir crypt was laid over and beyond the original stretch of the Bernward wall. However, Azelin's successor, Bishop Hezilo (1054-1079), abandoned the Azelin Cathedral, supposedly because of massive construction defects, and returned to the new building on the ground plan of the Altfrid Cathedral. On 5 May 1061, a new cathedral was consecrated. The western transept of the Azelin building, which was already close to being finished, became the Bishop's Palace. Under Bishop Udo (1079-1114), the construction of the St. Lawrence Chapel was begun in 1100, the upstairs of which was probably used as a chapter house. 20 years later, Bishop Bertolt I (1119-1130) coated the eastern apse of the cathedral with new stones and a frieze below the eaves. In the year 1131, Bishop Godehard was canonised. The wooden crossing tower was replaced by Bishop Bernard I (1130-1153) with a three-tiered stone tower in 1150; here, the smaller bells of the Cathedral's set were hung. The two-storey cloister on the east was given its present form. In front of the northern entrance into the transept, a narrow three-bay entrance hall was built. In 1192, Bishop Bernward was also canonised. Bishop Konrad II (1221-1246) brought special merit onto the diocese through the establishment and promotion of Holy Orders. The branch of the Franciscans reached Hildesheim in 1234. The city of Hildesheim had its city charter confirmed and documented. In the battle of Dinklar, the Hildesheim troops defeated the numerically superior Brunswick troops in 1367 under the symbol of the "Shrine of Our Lady" - the founding reliquary of the diocese. The gilding of the dome was funded from the ransom for the prisoners. The northern paradise of the cathedral was built in 1412, donated by canon Lippold Steinberg. It was the main prestigious access to the Cathedral from the city. In1546, Canon Arnold Fridag created a rood screen to connect the crossing to the nave of the Cathedral. After 1945, the rood screen was rebuilt in the Anthonius chapel. An important development took place in 1595: the Jesuits came to Hildesheim. They took direct control over the venerable school in the Cathedral and brought it to new heights as the Episcopal Josephinum Secondary School. From Hildesheim, the Holy order also organised a significant part of its mission and the educational work that had significant importance for the survival of the Catholic Church in post-Reformation northern Germany. The conversion of the Hanoverian sovereign Johann Friedrich opened new opportunities for the Catholic Church in the 17th century: On Christmas Day 1665, the Apostolic Vicar Valerio Maccioni, coming from Copenhagen to Hannover, celebrated the first Holy Mass after the Reformation in the Hanover chapel. As in Hanover after the conversion of Herzog Anton Ulrich von Braunschweig-Wolfenbüttel, Catholic services were once again held from 1708 in Wolfenbüttel and from 1709 in Braunschweig. Small communities began to increasingly develop. In the years 1708-1731, the style of the Cathedral’s interior was changed to Baroque. The ceilings and walls were covered with stucco and painted and the Immaculata Altar of Paul Egell was erected in the Cathedral. On 3 August 1802, the political sovereignty of the prince-Bishopric of Hildesheim came to an end with the occupation of the Hildesheim Domhof by Prussian troops. The papal bull (deed) "Romanorum Pontificum Impensa" reorganised the Hildesheim diocese. It was assigned the entire eastern part of the new Kingdom of Hannover. The Duchy of Brunswick was incorporated in 1834. The diocese thus extended from the North Sea to Hannoversch Münden and from the Weser to the Elbe and the Harz mountains. That has not changed much to this day. The western front of the Cathedral and its side chapels were demolished from 1841-1850. They were replaced by a twin-tower façade modelled after the Hildesheim church of St. Godehard. In 1850 the period of Bishop Wedekin began, lasting until 1870. Bishop Wedekin was in situ for the surge of growth for the Church in Hildesheim in the middle of the 19th Century. His tenure was characterised by the development of Catholic education, the creation of new communities in the Diaspora and the creation of new Holy Orders (Daughters of Charity, Augustine). From Wedekin's private art collection, a first Cathedral and Diocesan Museum was created. The Cathedral after the bombing on 22 March 1945. Not even a hundred years later, the diocese of Hildesheim experienced one of its darkest hours: on March 22, 1945, Allied bombs hit the cathedral. The Episcopal church was razed to the ground. In 1950, the decision was made for the reconstruction of the Cathedral to begin. During reconstruction, the builders followed the original plans and the Cathedral was rebuilt on the foundations of the Hezilo Cathedral. 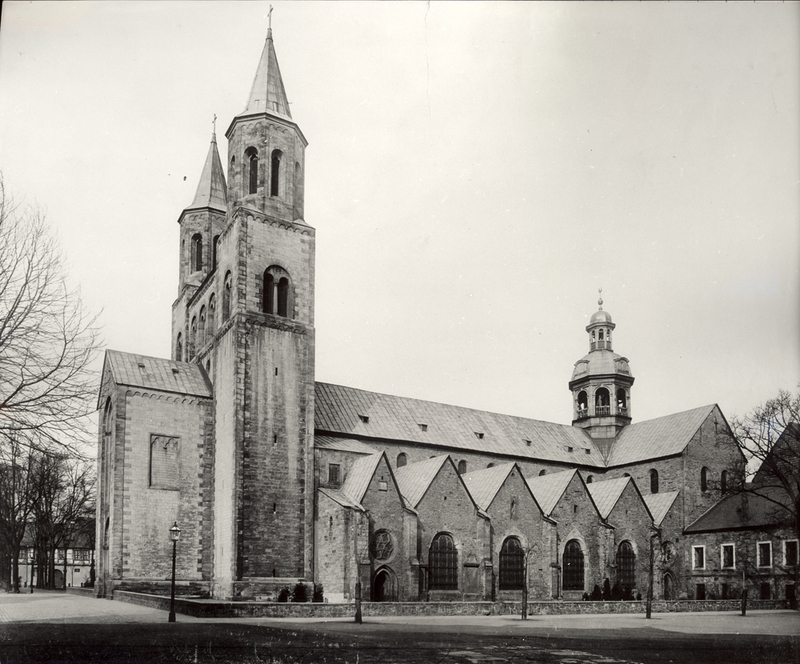 Ten years later, on 27 March 1960, Bishop Heinrich Maria Janssen (1957-1982) was able to open the Cathedral that had been rebuilt in accordance with the plans of Wilhelm Fricke, from Hannover. The Hildesheim Cathedral was the only Cathedral in Germany that had been so badly damaged during the Second World War that it had to be rededicated. Five years later, in 1965, Bishop Altfrid was canonised. Believers had venerated the Bishop as a saint for centuries. Between 1989 and 1990, a Diocesan Synod that had been convened by Bishop Josef Homeyer (1983-2004) under the motto "A new kind of church" gave invaluable impetus for further development. Since Homeyer, thousands of children and young people from across the diocese come together in the cathedral every year for Chrism and carol singer mass. In 2008, Bishop Norbert Trelle (since 2006) and the Cathedral chapter decided to fundamentally renovate the Cathedral by the Diocese anniversary in 2015. Two years later, the renovation that was begun is completed on 15 August 2014.